Summer patch caused by Magnaporthe poae is a highly destructive disease of Poa species and fine-leaved fescues. It is one of the most important causes of summer death of annual bluegrass. 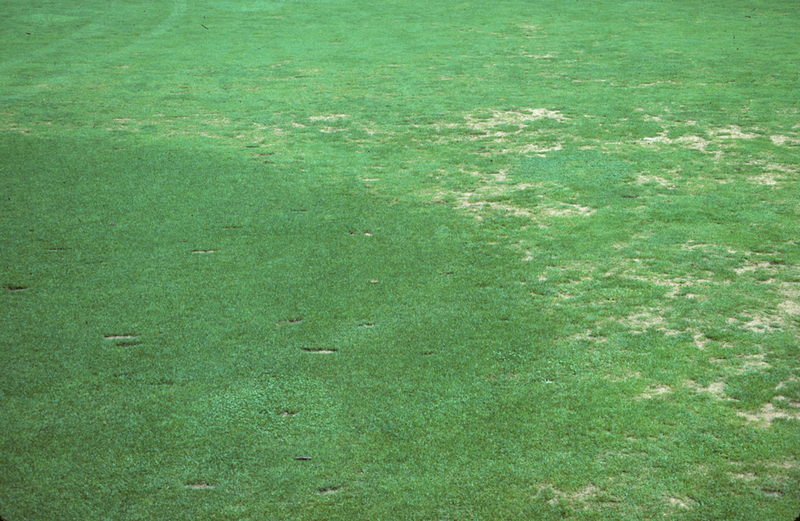 Symptoms of the disease first occur in the warm weather as small circular patches of slow-growing, wilted, and thinned turf. Patches enlarge into irregular, yellow to bronze colored areas ranging in size from 6" to 3' in diameter. The patches may coalesce resulting in large areas of blighted turf. As creeping bentgrass is not affected, a "frog-eye" type symptom may result when surviving bentgrass colonizes patches. Infected roots, crowns, and rhizomes turn dark brown as they die. 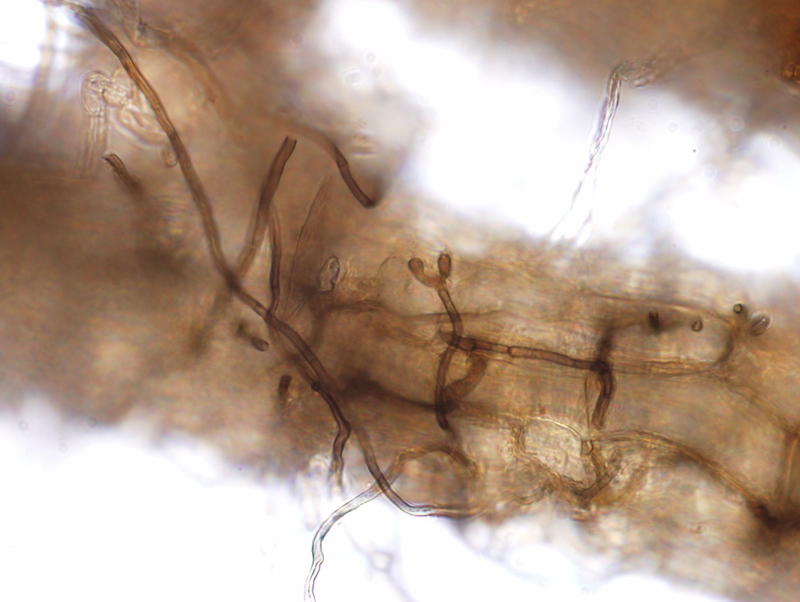 Dark, ectotrophic hyphae can be seen under the microscope growing on roots and crowns and extensive root and crown rot can develop. Summer patch symptoms are similar to those of necrotic ring spot; the pathogens can be differentiated based on temperature preferences as well as fruiting bodies and spores which are seldom seen in nature. M. poae survives the winter in infected plant debris or perennial hosts and moves from plant to plant by growing along the surface of roots and rhizomes. When soil temperatures warm to 65 °F, the pathogen invades root tissue but causes little damage until hot, rainy weather or periods of heavy rainfall or irrigation. The moisture pushes the oxygen out of the soil and weakens the roots of the grass plant, allowing the pathogen to invade the vascular system (the water and food conducting systems). Both water and nutrient uptake is impeded, as well as the movement of photosynthesic products from the foliage to the roots. Summer patch is most serious on sunny, compacted, and poorly drained sites during hot, wet years. Heat stress plays an important role in the development of disease; once root rot has occurred, drought stress can intensify symptoms. The disease is favored by quick-release fertilizers, nitrate forms of nitrogen, high pH, low mowing heights, and some contact fungicides. Since summer patch is a root disease, management practices that promote root development and reduce stress on the turfgrass are important management tools. Avoid low mowing heights, especially during periods of heat stress. Maintain adequate fertility as determined by soil tests. Apply acidifying fertilizers such as ammonium sulfate as nitrogen sources. Wash ammonium sulfate off leaves in warm temperatures to prevent foliar burn. Avoid the use of nitrate fertilizers which can intensify symptoms. Maintain soil pH between5.5-6.0 to prevent low soil pH problems such as nutrient deficiencies or aluminum toxicity. Annually, apply manganese sulfate at a rate of 2 lb/acre in the spring. Root infections are most damaging in warm, saturated soil. Aerify to relieve compaction, improve soil drainage, and improve oxygen penetration into the soil. Water deeply and infrequently. Syringing affected turf in the hottest part of the day to reduce heat stress can alleviate symptom expression. Reseed affected areas with resistant cultivars of Kentucky bluegrass bentgrass or perennial ryegrass. For best results, use mixtures or blends of resistant grasses. Preventive fungicide applications beginning when the soil temperature at 2 inches is 65 °F for 5-6 days, are more effective than curative treatments. Several commercially available biological control agents (bio-fungicides) have shown promising results with summer patch.